Are You a Candidate for Dental Implants in Ft. Collins? Dental implants in Ft. Collins are one of the best ways to replace missing teeth. They’re sturdy, they look like natural teeth, they can last for a lifetime, and they help to preserve your jawbone and face structure. Despite all of their advantages, however, dental implants aren’t suitable for everyone. Your circumstances may make it difficult or inadvisable for you to receive implants. What makes a good candidate for this procedure, and what factors might bar you from receiving this type of restoration? You have good oral and overall health. Your implant surgery is more likely to be successful if you don’t have any medical conditions that increase your risk of infection or will slow down healing time. Gum disease, diabetes, and anything that compromises your immune system are all causes for concern. You have a strong jaw. 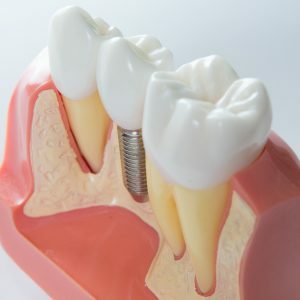 Dental implants bond with the jawbone, creating a connection that is similar to the bond between natural tooth roots and the jaw. For this bonding process — osteointegration — to succeed, you need to have a sturdy mandible with enough bone to provide a strong base for the implants. You are patient and committed to your oral health. The implant process can take several months to a year or longer, so you must be prepared to wait for your new smile. You also need to be determined to take good care of the implants after your surgery. You smoke cigarettes. Research has found that cigarette use drastically increases the chances that dental implants will fail. In fact, some studies have found that 20 percent of dental implant cases that involve smokers will fail. You severely grind or clench your teeth. These habits can put too much pressure on the implants, increasing the chances of failure. You are pregnant. Pregnant women should wait to receive implants because the anesthesia used in the surgery may affect the pregnancy. You are very young. Children’s jaws have not stopped developing, so it is better to wait until a person’s body is mature before the surgery takes place. Even if you think you are not a good candidate for dental implants, it’s still worth talking to your dentist in Ft. Collins about how to replace your missing teeth. You may be able to receive implants at some time in the future, or you might be able to take advantage of traditional dentures or bridges. Regardless of your circumstances, a complete smile may be within reach! Dr. Shiloh Lindsey is a Colorado native who is passionate about providing top-notch dental care to folks in her community. If you are interested in dental implants, Dr. Lindsey will be happy to discuss the procedure with you. You can contact our office at 970-482-3166. Comments Off on Are You a Candidate for Dental Implants in Ft. Collins?